Welcome to a new, limited series of articles covering the basics when it comes to painting models. 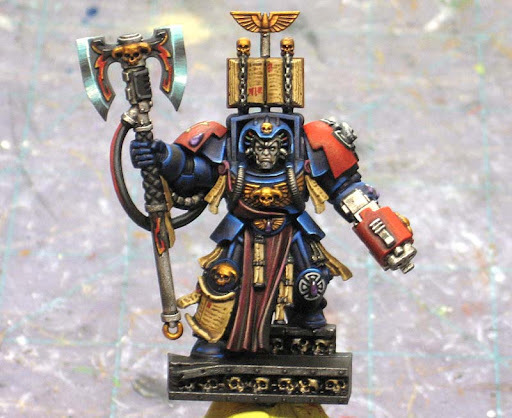 This series plans to show you a number of simple and easy to reproduce techniques to get your models up to a tabletop standard. For the next few months, Dave over at N++ Wargaming and I will be working together to show you all how you can get tabletop quality results for your models with a handful of simple techniques. Both Dave and I will be taking on a specific challenge every two weeks and covering that in our post. You all will be able to see how two different painters cover some basic concepts and the results we get. Now I've only been painting minis for about two years now, but I've learned more than I ever thought I would in that time. We all start out wondering how we're going to paint some of those tiny details, but once you "know how," it can be super easy to get some real nice results. Just looking at the Terminators at the top of the post shows you how far I've come in such a short time. The very far left one doesn't really count since he was done about a decade ago, but he makes for an interesting comparison. I'm sure having a degree in Art helps, but this isn't rocket science. It just takes a basic understanding and some simple formulas to be able to get good results. As Dave and I make our way through the topics, I'm planning on showing you guys the tricks I use and the order I do things in to get the results I do. Sometimes it's as simple as a particular color combination or a specific sequence of applying colors and washes. I have to say, this whole thing was Dave's idea and when he contacted me about the project to help people understand the simple stuff, there was no way I could turn him down. I had all kinds of stipulations about the project, but Dave heard me out and it was just too good not to be a part of after that. So, all that being said, look for the first post this coming Wednesday. Starting with light colored primers, both of us will taking a model from start to finish sticking to basic techniques only. We'll both have links to the other's articles as well so if you find one, you can find the other one without trouble. You can see Dave's Project Intro post here. The plan is to post each installment every two weeks until we get through all of them. I'm sure there will be lots of questions as we go through, so feel free ask away and we can always add things to help folks out with specific issues. Check out the complete Back to Basics Series here. I'm actually really excited for this, mostly for the Metallics and Armor. Now, that won't be addressed for a while (2 months almost?) but even though I'm making a tutorial on how to paint Grey Knights, I'm getting stumped on increasing my level of painting, and I'm pretty far down the painting ladder. I've practically hit a wall and I've read dozens of tutorials myself but nothing comes out looking any better than what I have when I pick up the brush. I'm hoping something you will address will give me that boost I need to finally increase my painting ability. I'm excited too! Dave is a tremendously generous guy and has a fantastic set of easy to find resources for any person interested in developing the painting side of their hobbying. Cheers to you and your partnership! This will be one to watch for the new guys and the old I am sure, this doesnt' happen to coincide with your new brush does it! I will if I can squeeze it in, copy the techniques you both describe and post them as a reference as well. Anon: In the tutorials section is a post I did on Black armour. It can be tricky, but easy once you understand what is important. Flekkzo: Dark Eldar are taken care of, I've got a couple of things covering them in the next month. Some definitely nice things for them actually. Read somewhere that to paint black you instead paint a very dark color and then highlight that. I can't give the reason why but I am going to give it a go with my legion of the damned in the future. Going to use a mix of black and mordian blue for a cool blue black and highlight it in blue. Time will tell how that goes. "We all start out wondering how we're going to paint some of those tiny details, but once you "know how," it can be super easy to get some real nice results." I haven't painted anything in over a decade and I was too young then to really understand what I was doing. I painted a test model for my DE over the weekend, and had a very hard time with the tiny details. I've seen plenty of tutorials and have a decent idea of what to do with stuff like gems and highlights, but when it came to actually doing it I couldn't even see what I was doing. Zheilt: Sorry to have to tell you that's old age. No tutorial for that unfortunately. Some people use magnifying glasses.. either lamp mounted or the type that straps to your head and folds down in front of your eyes.... I hope it's a long time before I'm at that point. Dave's answer is obviously way more helpful than mine. If you do go that route though (magnifying glasses), make sure to take frequent breaks to give your eyes a rest. My eyes are good enough, the things I was trying to paint were just so small. For example, painting eye lenses. Paint red, paint 2/3 lighter red, paint 1/3 orange, white dot highlight. How do you see something that small well enough to be able to only paint such a tiny-but-still-precise area? Guess I'll have to pick up a magnifier of some sort. Zheilt: There's a trick to doing it. I'll see if I can dig something up and get it posted this week. If it's hard to see details, but for other reasons that eyesight per se, it might be helpful to give the mini a wash. Either a light one after priming it to just pick out the details, or after the base coating to be followed by a light dry brushing.